More facts have emerged about the woman who was stripped n*ked and tortured over missing phone in Benin city, Edo state, about two weeks ago. 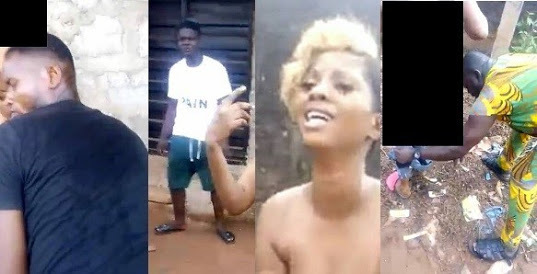 The 24-year-old lady identified as Favour Ada, alleged to be a commercial s*x worker, had pepper inserted into her private part during the brutal ordeal. The Edo Police command paraded the suspects responsible for the act and remanded three in custody including one Lucky Igbinovia (One-Man-Squad), a former aide to Mr Adams Oshiomhole, the National Chairman of the All Progressives Congress (APC) on community security. Narrating her ordeals in the hands of the suspects at the state police command headquarters in Benin, the lady who hails from Rivers State, told journalists that her worst moment was when they inserted pepper into her private parts, stripped her and videoed her. She said when she maintained her innocence; they stripped her n*ked, inserted pepper into her private parts and severely beat her up.